In February, during the Mobile World Congress 2017, Samsung took the wraps off the Galaxy Tab S3 tablet. The device has since been released to a good number of global markets, including the U.S. and Europe. As usual, the new Samsung Galaxy Tab S3 came in two variants – a Wi-Fi-only model and an LTE model. Where the former came in with model number SM-T820, the latter carries model number SM-T825. Before the South Korean tech giant unveiled the Galaxy Tab S3, there were lots of speculations – as usual – regarding the tablet. Leaks were all over, be it from renowned sources or even official certification bodies. At some point, the Wi-Fi Alliance listed a device with model number SM-T827 – a device that was rumored to be a third variant of the Tab S3 tablet but at launch, nothing materialized. 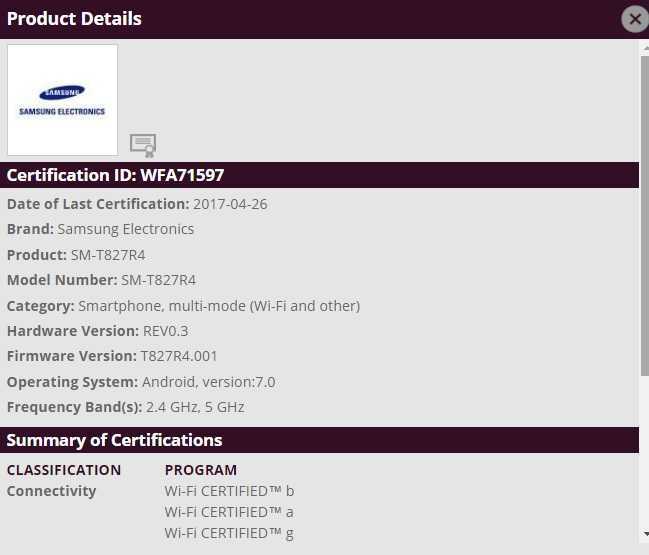 Now, this alleged third variant of the 2017 Samsung Galaxy Tab S3 has once again appeared on the same certification body, but this time, it has more details to it. In addition to carrying a slightly different model number as compared to the Wi-Fi-only and LTE variants already available in the market, the new listing further confirms that the device will be headed to one of the four major U.S. carriers. Carrying model number SM-T827R4, there’s no doubt that this device – if it’s indeed a Samsung Galaxy Tab S3 – is headed to U.S. Cellular. As usual with Wi-Fi Alliance certifications, the list doesn’t give out much. Other than the model number, the only other technical specification available is the operating system, which has been confirmed to be Android 7.0 Nougat, just like the other Galaxy Tab S3 models. At the moment, we cannot confirm whether this is indeed a variant of the new Samsung Galaxy Tab S3, but we should be able to get clearer details in due time. We’ll keep you updated!